b. 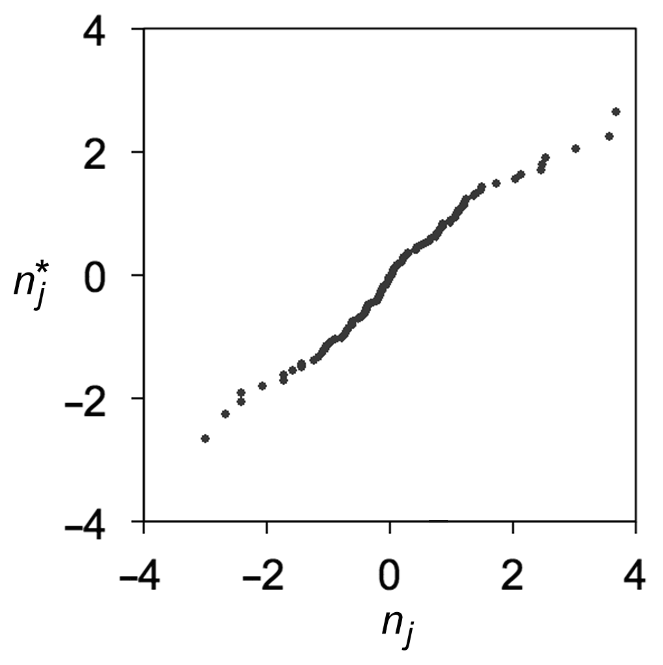 Given the assumption that tL is conditionally normal with t–1E(tL) = 0, and knowing that the the .99-quantile of a normal distribution occurs 2.326 standard deviations above the mean, we can infer from the value-at-risk values the conditional standard deviations of the tL assumed by those value-at-risk values—and hence the conditional normal distributions. With [14.9], recalculate the quantiles tu at which losses tl occur. With [14.10], we convert these to values tn. See spreadsheet. The points fall more-or-less near a line passing through the origin, but the fit is poor. Based on just the graph, it cannot be determined whether the poor fit reflects a shortcoming of the VaR measure or merely the limited data. We calculate the correlation between the nj and as 0.985. Based on Exhibit 14.6, we reject the VaR measure at the .05 significance level.